Have you ever walked past someone at the grocery store and noticed their cart was filled with cases and cases of oranges and wondered what their plan was for them all? How about that person at the checkout with six large watermelons on the conveyor belt? Why could they possibly need so many? Thankfully I finally have an explanation for these extreme fruit purchases that regularly puzzle me: ninja training. In the Fruit Ninja app, you play as a ninja apprentice trying to improve your skills by slicing fruits with a katana. All fruit thrown your way (appearing on the screen) must be sliced. If you miss too many or slice a lit bomb disguised as a coconut, you will lose. Ninja apprentices score points for each sliced fruit, as well as extra points for fruit combos (many fruits sliced by a single cutting motion). 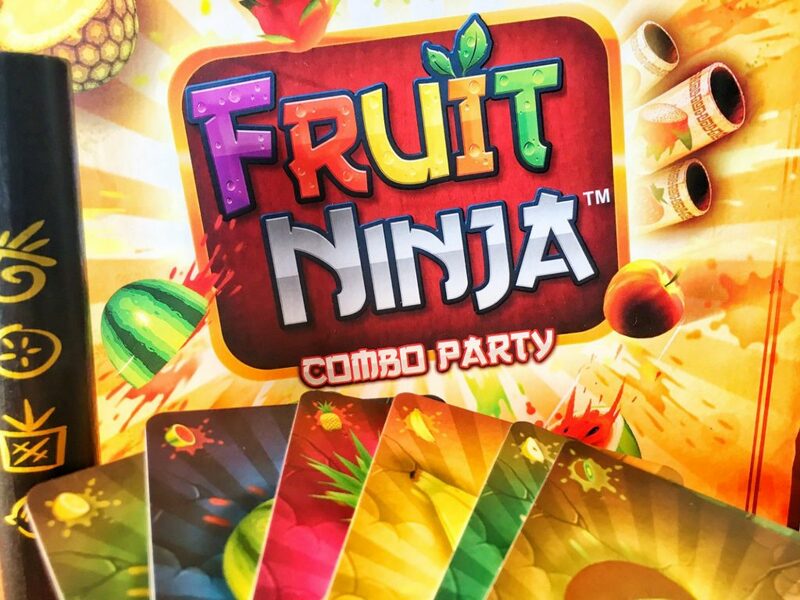 Fruit Ninja: Combo Party transforms this addictive digital game into a board game, focusing on a single aspect of your ninja training: creating the highest scoring fruit combos. As you can see I’m neither good at the app nor capable of slicing fruit and taking a screenshot at the same time. 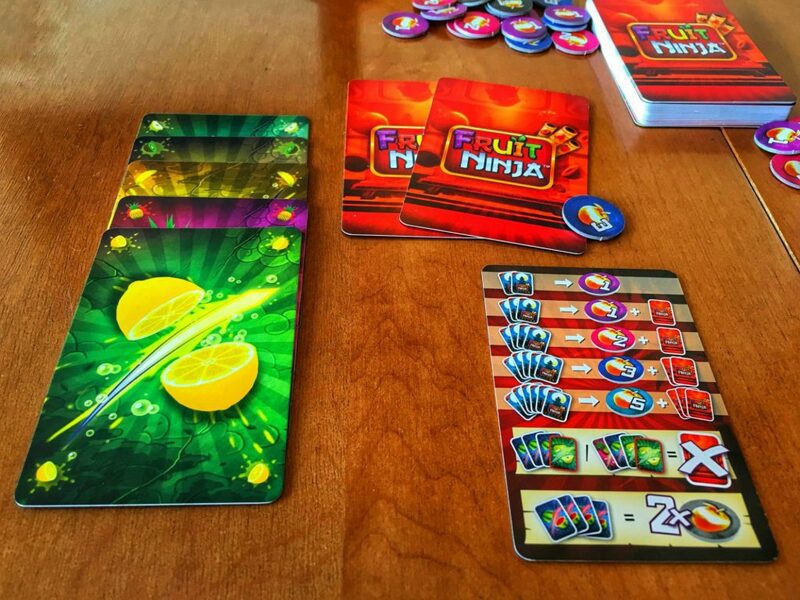 Fruit Ninja: Combo Party is a fast-paced, card-drafting game for 3 to 6 players, played over 2 to 4 rounds (depending on what the group chooses). 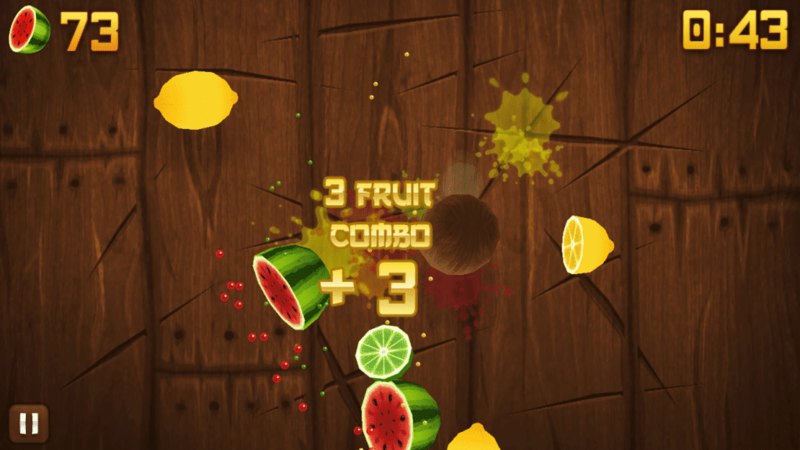 Each round players try to create the best fruit combos to score Golden Apples (victory points). At the end of the predetermined number of rounds, the player with the highest Golden Apple score will be the most promising ninja. A game of Fruit Ninja: Combo Party set up for four players. 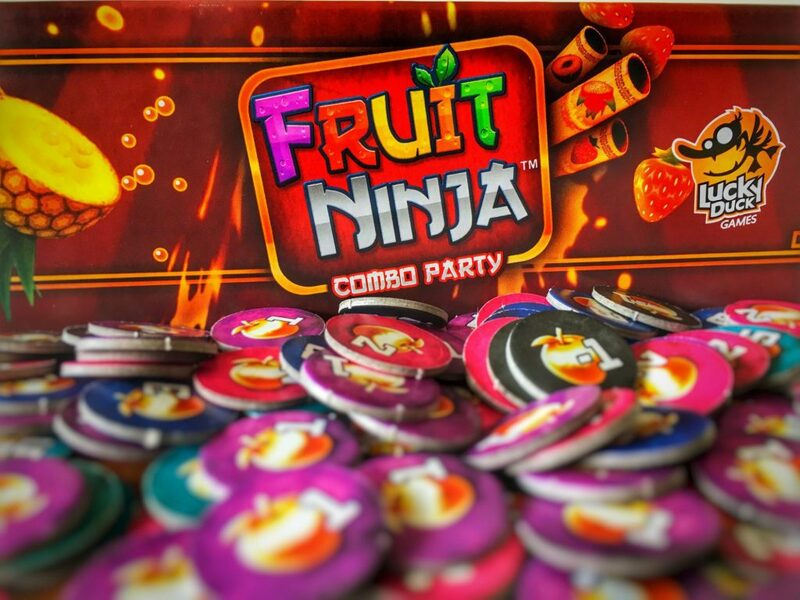 Each round of Fruit Ninja: Combo Party is played over 11 quick turns with each turn consisting of 3 phases (Fruit, Scoring, Drafting). In the Fruit Phase, players select and simultaneously reveal a Fruit card from their hand to add to their Combo pile. In the Scoring Phase, players decide whether to score their Combo pile or to keep pushing their luck for more Fruit cards next turn. In the Drafting Phase, each player passes their hand of cards to the next player. In the Fruit Phase, players select a Fruit card from their hand and place it face down in front of them. 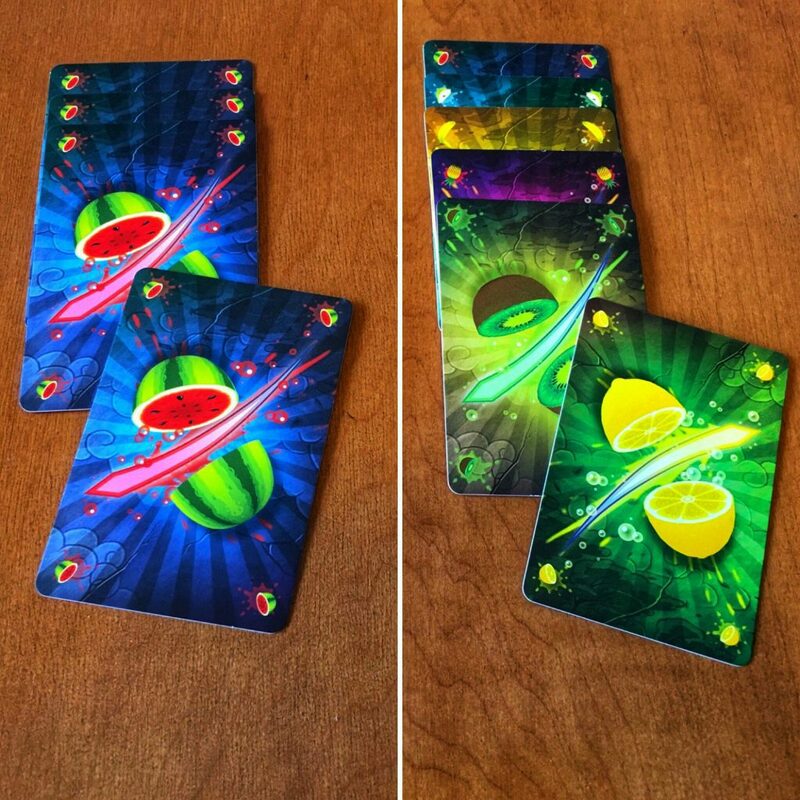 Once all players have chosen a card, they simultaneously reveal their Fruit card. 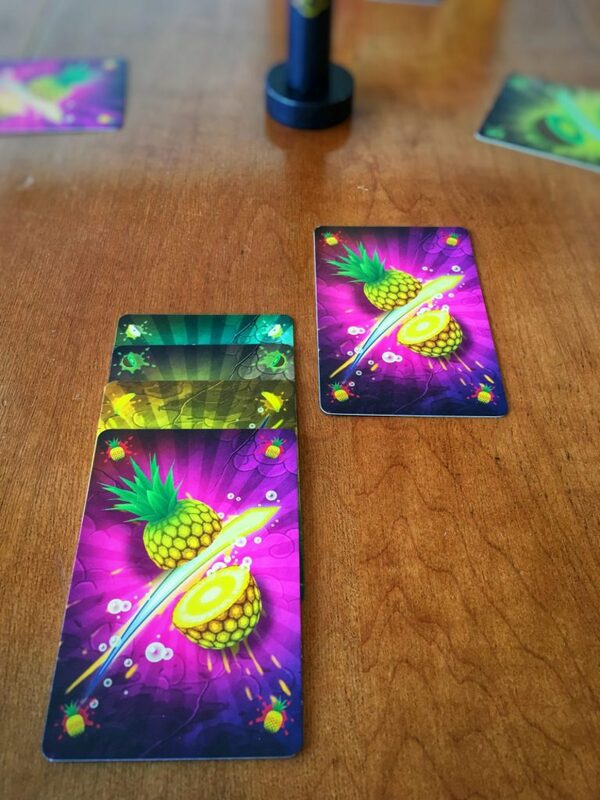 If any of the revealed Fruit cards match, the players who chose the matching cards race to grab the Katana handle from the centre of the table. The player who successfully grabs the Katana first randomly draws a Reward card. Reward cards can be worth 1, 2, or 3 Golden Apples. Next, all players check to see if their Fruit card can be added to their Combo pile. Combo piles are the main way for players to gain Golden Apples, but each player may only have a single Combo pile at a time. A Combo pile can either have cards of a single type of fruit or uniquely different Fruit cards. These are both valid examples of Combo piles. If the Combo pile is still valid after a player has added the new Fruit card, then they can choose to continue to add cards to it next turn or score it in this turn’s Scoring phase. If the Combo is no longer valid, the last Fruit card (the one played this turn) is discarded and the player is forced to score their Combo in the next phase. This is an invalid Combo pile because it contains two cards of the same fruit. This is, of course, the traditional way to tell if a ninja is any good at ninja-ing. In this phase, players may score their Combo pile (or might be forced to do so) and will gain Golden Apple tokens. Based on the type of Combo and the number of cards in it (up to a maximum of 6 cards), they might also get bonus Reward cards. The player aid included in the game breaks down exactly which rewards a player will receive when scoring a certain size and type of Combo. The player aid tells you how many Golden Apples (and possibly Reward cards) you receive. In this case, the player would get a 3 Golden Apple token and 2 random Reward cards. There are also a few special rules that can change the rewards a player earns. If a player scores a Combo pile with all the same fruit then they receive double the number of Golden Apple tokens for that Combo. If a player is forced to score their Combo (because they had to discard their Fruit card in the previous phase) then they don’t receive the Reward card bonus for their Combo pile, regardless of its size. Once all players have scored or chosen to continue pushing their luck to grow their Combo pile, play proceeds to the Drafting phase. Each player passes their hand to the next player (with the drafting direction alternating between left and right each round). The next turn then begins again with the Fruit phase. The 3 phases of a turn continue in this way until players have used all cards in hand but one (eleven turns/cards in total). The last card is discarded, players add up their points on their Golden Apple tokens and Reward cards, and record it. 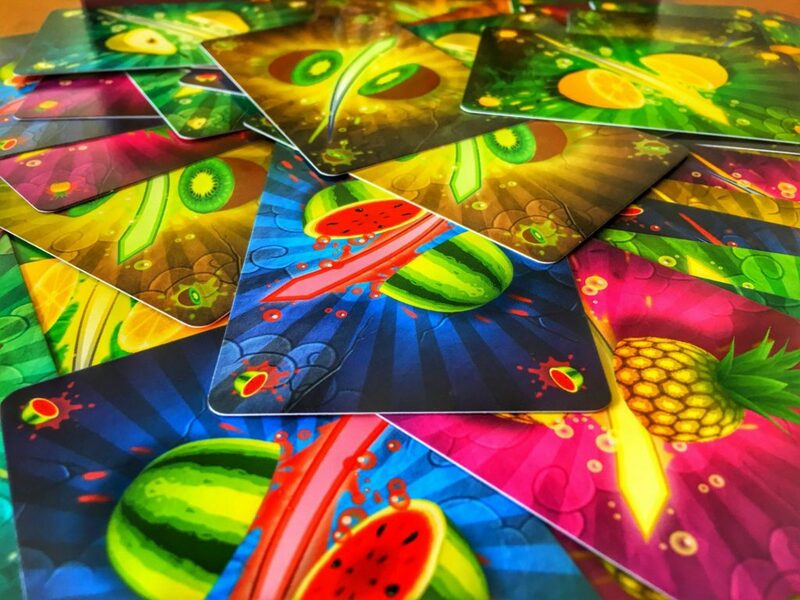 A new round begins with each player receiving a hand of 12 Fruit cards and beginning a new round in the Fruit phase. I like this game, but I do have some quibbles about it and I wonder if parts of this game could have spent a little longer in ninja training. The art used in Fruit Ninja: Combo Party is taken from the app and it depicts some of the characters, objects, and fruit found in it. Since the game is an analog reimplementation, I don’t mind this. What is strange is that at least half of the box art shows fruits that are not in the board game. Embellishment is fine, but this seems to be more of a replacement since the art doesn’t even show all the fruit that’s actually in Fruit Ninja: Combo Party. This is a minor complaint and is something that can be forgiven since it doesn’t affect the gameplay, but I still find it an odd graphic design choice. I have a hard time being as forgiving with the rulebook. I’ve read many rulebooks and I enjoy doing it, but this does mean that I evaluate rulebooks quite scrupulously. The overall feeling that I got from this rulebook was that perhaps the game’s publication might have been a little rushed. There is a typo, a mistranslation that could lead to incorrect gameplay, and the score pad isn’t listed under the components. The score pad in particular feels like an afterthought since the rulebook states that the game can be played over 2 to 4 rounds, yet the score pad only goes up to 3 rounds. It also feels like a missed opportunity that the number of cards for each fruit isn’t included since card counting is an important part of this game. Everything I describe here is pretty minor and thankfully doesn’t really impact the gameplay, but it did unfortunately leave the taste of a poorly sliced lemon in my mouth. My criticisms aside, I quite enjoyed this game. I admittedly went into my first play of the game with reservations. I wasn’t sure the gameplay would be enough to live up to the Fruit Ninja app. Even after reading the rulebook and learning more about it, I wasn’t convinced that the game would involve much strategy. I was pleasantly surprised that this was not the case, but it did take a number of turns before the depth of the game revealed itself. Similar to games like Citadels and Not Alone, Fruit Ninja: Combo Party shines if players anticipate what others will do on their turn. During the Fruit phase, you must ask yourself questions like, “Do I intentionally choose a card I know another player will also choose so that I can race (and likely beat) them to the Katana handle?” or “Should I hate draft and select the last card of the fruit type my opponent wants from this hand even if I cannot use it in my Combo pile?”. In the Scoring phase you must consider whether you score a Combo even if you don’t get much reward just because you can’t remember if the Fruit cards you want are still in hand. Or perhaps you have been card counting and know there are no more of the Fruit cards you need so it is in your best interest to score. It is these kinds of questions, choices, and internal back-and-forth dialogue in later turns of a round that make this game fun, interesting, and sometimes unpredictable. At its heart this is a party game, meant to bring a larger group of people to the table for a fun social experience that doesn’t overstay its welcome (if you play only 2 or 3 rounds). It doesn’t take itself too seriously and that’s why it succeeds in doing what it intends to do. When I play Fruit Ninja: Combo Party, I don’t necessarily feel like I’m as tense and stressed as I am when I play the digital game. 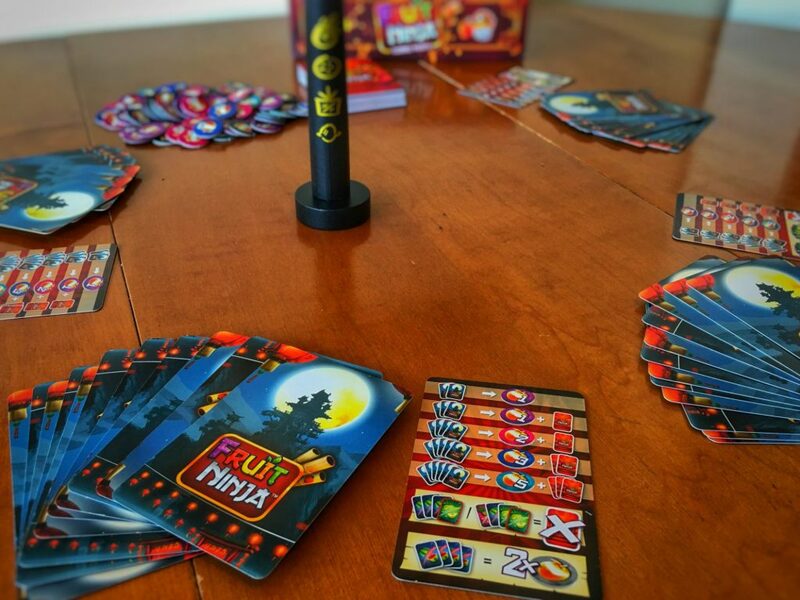 However, the board game does still capture some of that frenetic energy, especially in moments of anticipation before the simultaneous card reveal in the Fruit Phase or when you’re racing to beat a player to the Katana. Whether you are a heavy strategy board gamer or just someone looking for a fun game to play with family or friends, this game is a good choice because the depth and level of strategy in the game depends on what the players around the table put into it. Whatever you choose, the gameplay experience will be an enjoyable one. Fruit Ninja: Combo Party is from publisher Lucky Duck Games. For more from them, check out our reviews of Vikings Gone Wild and their upcoming releases, Chronicles of Crime and Jetpack Joyride.